Advanced Trend Analysis from within Excel! Now, more than ever, you need to know the impact of your individual media and marketing efforts. Introducing BrandTrend XL -- a breakthrough in media and marketing analysis. 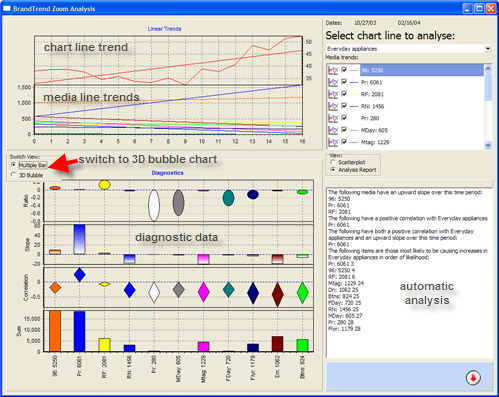 And the easiest way to produce trend charts! All you need is Excel, your trend data, and BrandTrend XL. Please contact us to set up a web demo and discussion of your needs. (A useful reference when viewing the video! Copyright © 2012-2018 WRC Research Systems, Inc. All Rights Reserved.